Here’s an annotated list of prayers suitable for public and private memorials, including “A Liturgy for 9-11,” written for the 10th anniversary of the attacks on the U.S. The original four prayers in “A Liturgy for 9-11” were written to commemorate the 10th anniversary of the attack. See that post to read the story of these prayers. The response to the original post was overwhelming. Here’s a link to an overview of some of the ways these prayers were used as part of 10th commemoration activities. All of these works are © 2011-2013 Alden Solovy and www.tobendlight.com. All rights reserved. 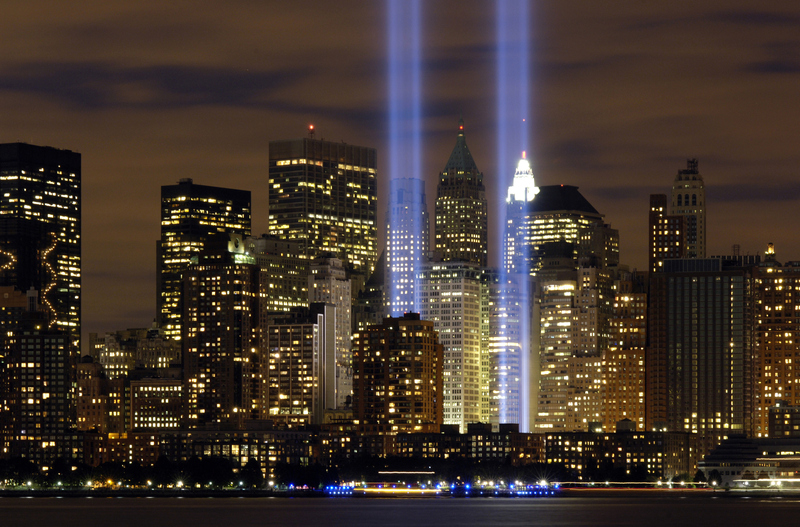 Photo Source: Wikimedia Commons, the “Tribute in Light” memorial is composed of two banks of high wattage spotlights that point straight up from a lot next to Ground Zero. The photo was taken from Liberty State Park, N.J., on the five-year anniversary of 9/11.